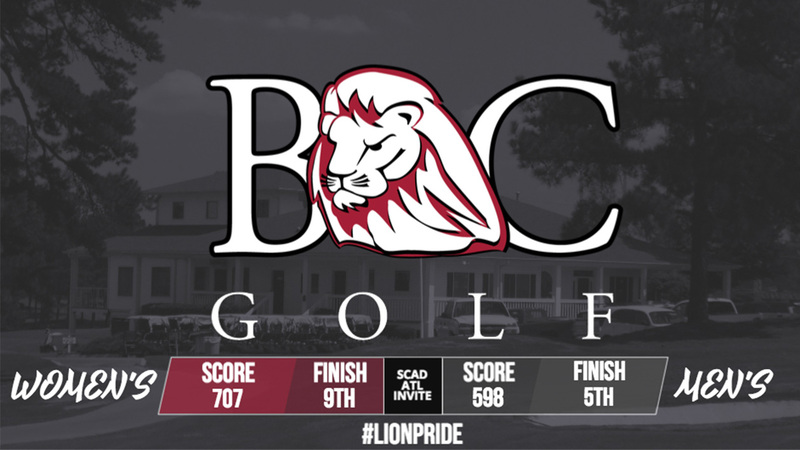 COVINGTON, Ga. – The Bryan College Lions men’s and women’s golf teams started their fall season at the SCAD Atlanta Invitational, which took place at the beautiful Oaks Golf Course in Covington, GA Sept 4-5. Freshman, Peter Brown led the Lions on Day 1 and Day 2 of the tournament, recording a 71 on the first day and 72 on the second to begin his college career with a strong 143 performance. He was followed closely on Day 2 by juniors Kevin Knudsen with a 73, Zach Belvin at 74, and Andres Arteaga at 76 to end the day with a 295-team score and a two-day total of 598. Brown’s 71 and 72 for a 143 was good for 9th place in a strong field, which was led by medalist Matt Nuttall of Faulkner University (Ga.) who shot a 64 and 66 for an impressive 130. Nuttall eventually won in a playoff over Dawson Day of fellow Appalachian Athletic Conference school, Truett McConnell University (Ga.), who also tallied an outstanding 130, setting a new tournament record for the event. On the women’s side, the Lady Lions were without reigning AAC champion, Krista Reinhardt, but it was sophomore Daniella Banda who helped lead the team while competing in her first event as a Lion. Banda fired a low round for Bryan on the opening day with a 79, only to be matched by sophomore Taylor Williams on Day 2 with a 79. Both Lions finished at 164, matching each other for 30th place. The next challenge awaiting the women’s side will take place Sept. 17-18 at the Tennessee Wesleyan Fall Invitational, hosted by the Bulldogs at the Springbrook Golf & Country Club in Niota, Tenn. The men will not play again until the 1st and 2nd of October, when the Lions travel to Fincastle on the Mountain, which is where the AAC Fall Preview will take place. The two-day event will be hosted by Bluefield College (Va.) in Bluefield, Va.